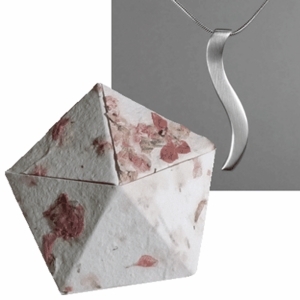 Silver Ogee necklace in Origami Box: Slowly unfold the paper box to reveal an elegant silver necklace! The 10 sided origami box has been folded from thickly textured paper, crafted from natural bits of flowers and leaves. 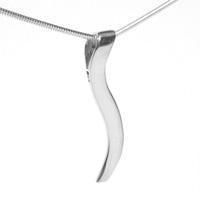 The sensuous sterling silver Ogee pendant (1-1/2" long) and matching chain are hidden within it. Customer Reviews for "Silver Ogee Necklace in Origami Box"